“The Great Battle” provides action with sprinklings of light-heartedness, but falls short on screenwriting. In the 7th century, the Korean peninsula was engulfed in conflict between three warring states: Silla, Baekje, and Goguryeo. The Chinese Tang Emperor Taizong saw an opportunity when Goguryeo’s King Yeongnyu was assassinated by a warlord named Yeon, and used the assassination along with a plea for military aid from Silla as pretext for invading Goguryeo. Emperor Taizong had a number of initial successes before reaching Ansi Fortress, where the local commander, Yang Manchun, was able to successfully fend off the Tang attack. The Great Battle dramatizes the defense of Ansi, starring Jo In-sung (Love Impossible, The King) as Yang alongside an ensemble of military officers tasked with defending their home city. The Great Battle tries to stay true to the historical roots of the actual Siege of Ansi. In the film, a young military officer from the eponymous city, Sa-mul (Nam Joo-hyuk), is sent by warlord Yeon (Yoo Oh-seong) to assassinate Yang. In real life, Yang was a military commander who refused to surrender to Yeon after Yeon assassinated King Yeongnyu and subsequently seized control of Goguryeo’s government. After an initial attempt to seize Ansi by force failed, Yeon begrudgingly let Yang remain as commander of Ansi. Whether Yeon actually wanted to assassinate Yang in reality is up for debate, but it certainly makes for great acting. 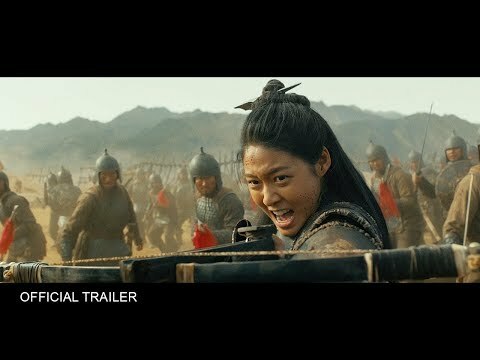 In The Great Battle, Sa-mul has to balance his desire to defend his hometown with his assignment to kill Yang — and this tension gives him room to grow and develop over the course of the film. The film is not all drama though; it contains many light-hearted scenes sprinkled throughout. We meet various defenders of Ansi fortress as they go about their lives, as rival lieutenants brawl in the streets, and Yang catches his sister Baek-ha (played by AOA’s Seolhyun) in bed with one of his cavalry officers. Things quickly take a turn for the serious when Emperor Taizong personally leads the Tang army’s attack. Yang’s men — and a detachment of female crossbow operators — deal with wave after wave of combat. The Tang army deploys everything from ladders to siege towers, and even starts constructing a dirt mound in an attempt to scale the imposing walls protecting Ansi. At the same time, Yang comes up with creative defenses that range from humble rocks to oil bombs ignited with flaming arrows. However, while the The Great Battle excels at action-packed scenes and a fast-moving storyline, the screenwriting falls short. A mysterious oracle who happens to be Yang’s former love interest makes an appearance, but adds little to the story before she is quickly killed off. And much to our dismay, Baek-ha never gets to fully develop her relationship with her dashing cavalry officer before he dies in combat. While this may be due to the limited running time of 136 minutes, director Kim Kwang-sik could have taken a page from John Woo’s Red Cliff and split the film into two parts to give the ensemble cast ample time to develop their characters. Nonetheless, The Great Battle won numerous awards for its acting and cinematography, and it remains firmly in our list of the best Korean movies of 2018. The Great Battle is available on Amazon Prime Video and Blu-Ray / DVD. The Great Battle (Hangul: 안시성; Hanja: 安市城)—south Korea. Directed by Kim Kwang-sik. First released September 2018. Running time 2 hrs 16 minutes. Starring Jo In-sung, Nam Joo-hyuk, Park Sung-woong, and Kim Seol-hyun.